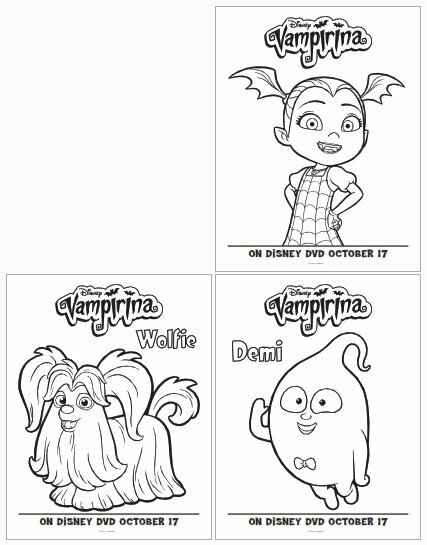 Disney Vampirina digital card to invite birthday by printing it or by whatsapp. 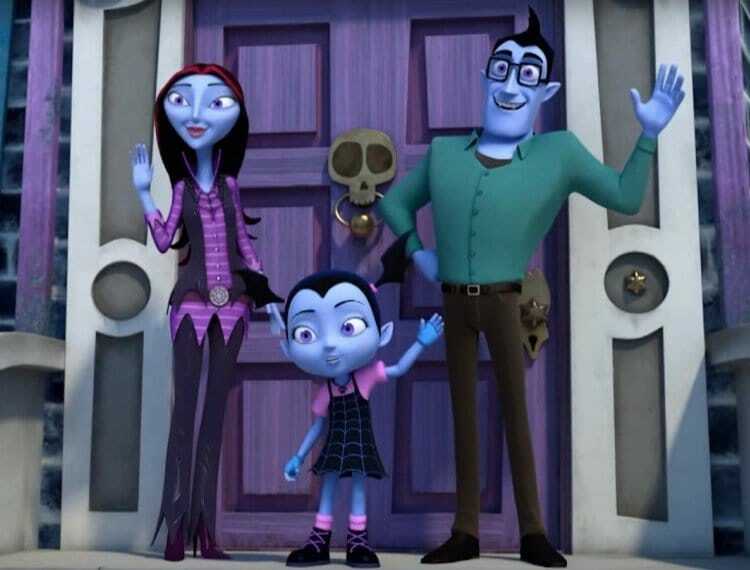 Apenalties one month before Halloween, Disney Junior launched a new series with a Vampirina as the protagonist. 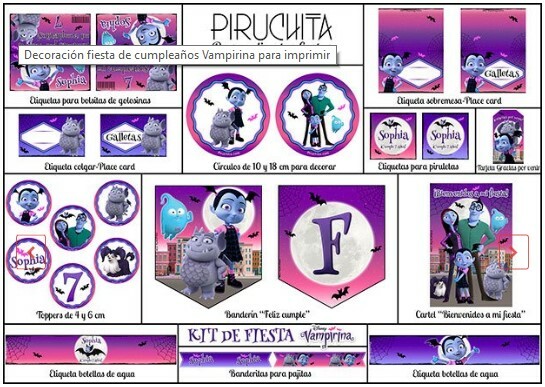 As always, from Piruchita, we offer you quickly the Disney Vampirina Birthday Invitation for FREE, you just have to download, print, and fill in the details of the party to deliver to the guests of this special party. Vee is the name of our protagonist, a vampire girl who moves with her family from Transylvania to Pennsylvania to open a local "Bed and Breakfast" called Scare's B & B for visiting demons (including vampires and goblins). Vee will face the joys and trials of being the new girl in the city where she will make new friends. This series is created between the United States and Ireland by Anne Marie Pace and Chris Nee. As usual at Disney, along with the series, they will offer many digital contents, such as Disney Junior YouTube channel videos, online games, printables to paint, or the opening song in karaoke format so that the little ones can sing and record it his own version. 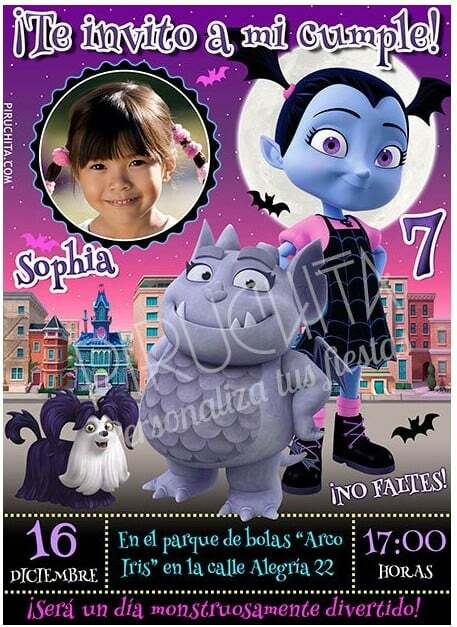 The 1 of October premiered Vampirina at Disney Junior for USA and Latin America. In Spain the first chapter began to be issued this past 11 of October to the 21: 00h also in Disney Junior, where a new chapter is issued every Wednesday at the same time 21: 00h. To date 26 November have already been issued 14 episodes of the first season in the USA, and it is expected that they will be able to broadcast 2 seasons with 34 chapters of about 24 minutes each. Coloring Vampirina. Download this PDF and print it. Your children can have a good time painting some characters. You can print them as many times as you want. 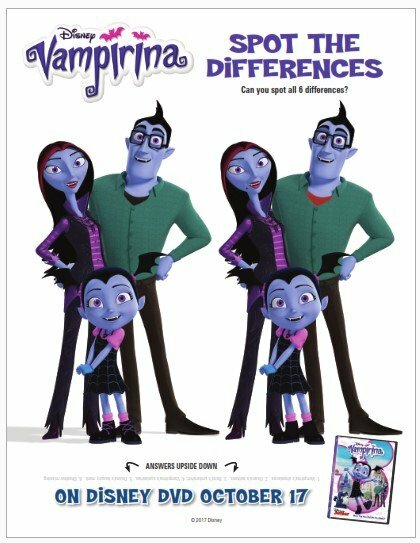 Find the differences of Vampirina. You can look for them in the computer or better print them and search with your children, they will have a good time. 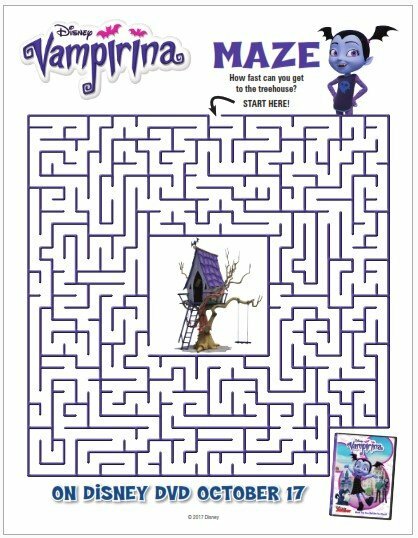 The labyrinth of Vampirina it's for smarter kids, you'll have to try several times until you get it, do not give up and feel proud when you get it! Do not forget that they are drawings for children, you can not judge or value the series based on how Vee and his family members can become dust when receiving sunlight. Surely it is the first thing that has crossed your mind, but Disney seeks a different approach. He wants to show values ​​such as that being different in appearance from the people around you does not mean that they can not be integrated as one. Everyone can become friends regardless of their origin or appearance. The visual aspect, design and animation, is 100% disney, nothing new, but no less attractive. As always very colorful and striking. The music also very catchy will make all the kids dance. This is the typical series where age does not matter, 2 children, 13 pre-adolescents and 30 year olds can all see it. Possibly one of the best Disney Junior series currently in broadcast. The free invitation can be downloaded below, but it has a small drawback: you will have to fill in by hand with a ballpoint pen or marker the data as the day and place of the event. Also, it will not include any personalized data. For this reason, we also offer you the service of PERSONALIZATION PREMIUM in which the personalization is complete, since it will include additional information such as the name and age of the birthday boy, a photograph (if the invitation is available in that version) and the data of place, date and time of the birthday, all integrated perfectly and with a very professional finish. The prices are very cheap, just 7,95 € for the text-only version y 9,95 € if you want us to add the photo (for invitations that are available with photo). 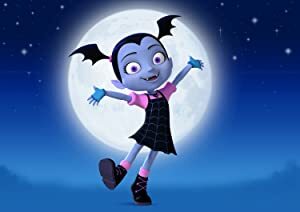 Now, and if you really want to leave everyone hallucinating at the party and be the person most loved by your son or daughter, you should set up the 100% themed birthday party on Vampirina. In Piruchita.com you can find a digital printable online kit that we will customize specifically for you with the birthday information, showing your name and age and being fully integrated. You only have to buy it for just 19,95 € and in only 1 or 2 working days we will send you the kit already customized and ready to print. What are you waiting for? 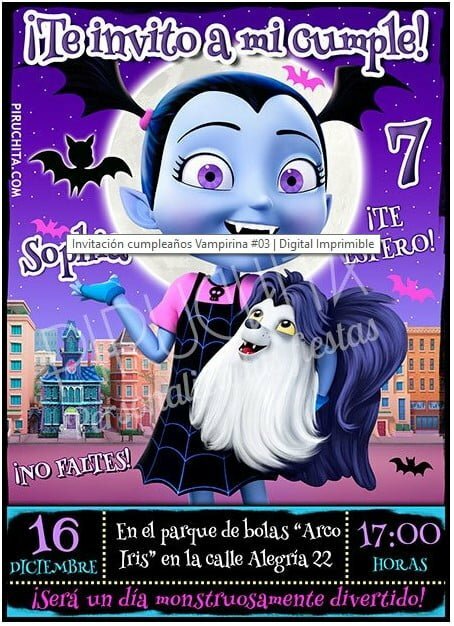 La Vampirina Disney Birthday Invitation is designed in high quality, 300 dpi, perfect for printing both at home with any type of printer, as well as in a printing or online printing service. Enjoy a great birthday party!